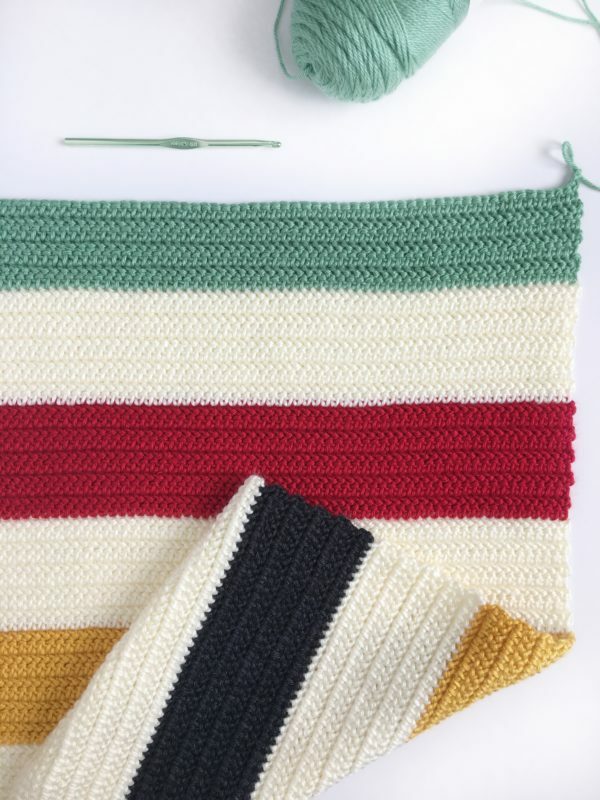 What an exciting time I’ve had creating this crochet Hudson’s Bay inspired blanket for a new little one. I’ve been collaborating with my sweet Meagan, (she babysat my kids for years and was an amazing mother’s helper,) with a design for her almost to be born little boy. Meagan was inspired by a blanket she had found in her parent’s attic. It had a vintage feel to it, and she remembered her dad using it on camping outings. She created a pin board around that theme and I studied the pictures. I kept being drawn to this pattern but for some reason never thought to Google the name of it. It took me some time to find a yarn I liked, that had all the colors I needed to make this. Finally, I decided to use Caron Simply Soft in Gold, Heathered Charcoal, Sage and Autumn Red. I knew I could possibly pick a more lemony yellow, but I couldn’t find a light teal, so I stuck with the more fall colors. Then, I posted my progress on Instagram, and what do you know! This is a very popular pattern in Canada! A classic! As popular as the Stars and Stripes in America. I was so embarrassed I hadn’t done more research. No wonder it was popping up across Pinterest. I kept seeing the name Hudson’s Bay, but only thought it was a brand name of a store, not the name of a vintage blanket pattern. So many of my Canadian crochet friends/followers then took the time to tell me all they could about the pattern and it’s amazing. Then I looked into the history of crochet, to find a perfect stitch to go along with this blanket, and discovered that crochet was becoming popular at about the same time, although never used together. A Hudson’s Bay Blanket is a woven wool blanket. But still, I’m glad I chose to make this blanket using the classic herringbone half double crochet stitch. In the second chain from the hook, work your first HHDC. Or, if you did a foundation chain, Chain 2 and then work your first HHDC into the first foundation row chain. I also give you tips on turning on the ends and how I like to do it in the video. But in case you don’t watch the video here is what I tell you: I like to chain 2 at the end of every row and then work my first stitch into the first stitch of the new row. I do not treat the chain to as the first stitch. It simply adds height. This is personal preference. If you like working into the turning chain when you get to the end of the row feel free. I do not, and that is why I work into the last HHDC and not the turning chain. I worked the first ten rows in off-white, the next ten in Heathered Charcoal, the next ten in Off-White, the next ten in Gold, ten in Off-White, ten in Autumn Red, ten in Off-White, ten in Sage, ten in Off-White. I wove in all the ends before starting the border. I pulled up a loop in any corner, with Off-White and worked one HHDC into the same place and in every stitch around the blanket. I worked 10 per each color on the sides and three into each corner. When finishing a round, I worked the final 2 HHDC into my starting space, slip stitched to the starting HHDC, Chained 2 and worked 2 more rounds around the entire blanket in HHDC, always working 3 into each corner. Before my blankets leave the farm, I give them a nice soak in my tub! I prefer to hand wash them in warm water with ZOTE soap. It’s gentle and smells good. Then I gently squeeze out as much water as I can and roll it up into a giant beach towel. I use a second beach towel and lay the blanket out and shape it as best I can. I don’t use pins or anything, just pull a little here and there. Caron Simply Soft is a great yarn to let you do this with. I also love I Love This Cotton and might make another using that. But this again, is personal preference. There is no right or wrong way to wash a blanket. I just don’t like machine washing hand work. I prefer hand washing. 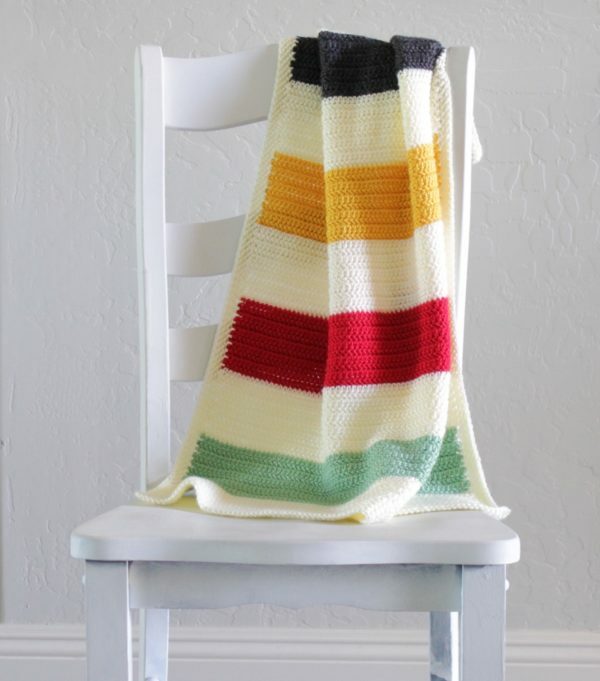 Enjoy your crochet Hudson’s Bay blanket! And come find me on Instagram @daisyfarmcrafts and share a picture of your project! Tag me!